treatments and casting of steel etc. Because of this, it is of particular significance to determine how pure the steel is. The term steel cleanness is relative one, since even steel with only 1 ppm each of oxygen and sulphide will still contains billion to trillion non metallic inclusions per ton. 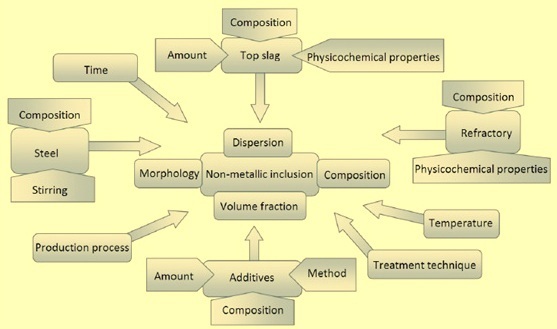 Various factors which influence the non metallic inclusions in steel are shown in Fig 1. Non metallic inclusions are chemical compounds of metals (e.g. iron, manganese, aluminum, silicon, and calcium) with non metals (e.g. oxygen, sulphur, carbon, hydrogen, and nitrogen). Non metallic inclusions form separate phases. The non metallic phases containing more than one compound (e.g. different oxides, oxide + sulphide) are called complex non metallic inclusions (spinels, silicates, oxy-sulphides, carbonitrides). Despite the presence of non metallic inclusions in steels in small percentage (0.01 % to 0.02 %), they have a significant effect on the properties of steels. They are the cause for dangerous and serious material defects such as brittleness and a wide variety of crack formations. However, some of these inclusions can also have a beneficial effect on steels properties by nucleating acicular ferrite during the austenite to ferrite phase transformation especially in low carbon steels. The properties of steels generally affected by the non metallic inclusions include tensile strength, deformability or ductility, toughness, fatigue strength, corrosion resistance, weldability, polishability, and machinability. Depending on the source of origin, non metallic inclusions are classified into two groups namely endogenous and exogenous inclusions. The endogenous inclusions are formed by precipitation within the liquid phase due to the decrease of the solubility of the chemical species contained in the steels. This type of non metallic inclusions cannot be completely eliminated from the steel but their volume fraction and the average size can be decreased by strict control in order to avoid their damaging action. The exogenous inclusions comes to the steel as a result of the trapping of non metallic materials coming from slag, refractory fragments or from casting and covering powders used for protecting the steel and avoiding sticking during the casting. This type of non metallic inclusions is featured by large sizes and their origin cannot be immediately recognizable, although their presence can strongly affect the micro structural soundness of the steels and the associated mechanical reliability. Another classification of the non metallic inclusions can be based on their chemical composition. The non metallic inclusions can be synthetically classified as oxides (FeO, Al2O3, SiO2, MnO, Cr2O3, Al2O3.SiO2, Al2O3.FeO, Cr2O3.FeO, MgO.Al2O3, and MnO.SiO2 etc. ), sulphides (FeS, MnS, CaS, MgS, and Ce2S3 etc. ), nitrides (TiN, AlN, VN, and BN etc. ), carbides (Fe3C, WC, Cr3C2,Mn3C, and Fe3W3C etc. ), phosphides (Fe3P,Fe2P, and Mn5P2 etc. ), oxy-sulphides (MnS.MnO, Al2O3.CaS, and FeS.FeO etc. ), and carbonitrides [Ti(CN), V(CN), and Nb(CN)] etc. There are three stages in the process of inclusions formation. These stages are described below. Nucleation – At this stage nuclei of new phase are formed as a result of super saturation of the solution (liquid or solid steel) with the solutes (e.g. Al and O) due to dissolution of the additives (deoxidation or desulphurization agents) or cooling down of the steel. The nucleation process is determined by surface tension on the boundary inclusion-liquid steel. The less the surface tension, the lower super saturation is needed for formation of the new phase nuclei. The nucleation process is much easier in the presence of other phase (other inclusions) in the liquid steel. In this case the new phase formation is determined by the wetting angle between a nucleus and the substrate inclusion. Wetting condition (low wetting angle) are favorable for the new phase nucleation. Growth – Growth of a new inclusion continues until the chemical equilibrium is achieved (no super saturation). Growth of inclusions in solid steel is very slow process therefore a certain level of non-equilibrium super saturation may be retained. Coalescence and agglomeration – Motion of the liquid due to thermal convection or forced stirring causes collisions of the inclusions, which may result in their coalescence (merging of liquid inclusions) or agglomeration (merging of solid inclusions). The coalescence/agglomeration process is driven by the energy advantage obtained due to the decrease of the boundary surface between the inclusion and the liquid steel. Inclusions with higher surface energy have higher chance to merge when collide. Large inclusions float up faster than the smaller ones. The floating inclusions are absorbed by the slag. The floating process may be intensified by moderate stirring. Vigorous stirring results into breaking the larger inclusions into smaller sized inclusions. Gas bubbles moving up through the liquid steel also promote the inclusions floating and absorption by the slag. The non metallic inclusions are having different shapes which are described below. Globular shape – This shape of inclusions is most desired since their effect on the mechanical properties of steel is moderate. Spherical shape of globular inclusions is as a result of their formation in liquid state at low content of aluminum. Examples of globular inclusions are manganese sulphides and oxy-sulphides formed during solidification in the spaces between the dendrite arms, iron aluminates and silicates. Platelet shaped inclusions – Steels deoxidized by aluminum contain manganese sulphides and oxy-sulphides in form of thin films (platelets) located along the steel grain boundaries. Such inclusions are formed as a result of eutectic transformation during solidification. Platelet shaped inclusions are not desirable. They considerably weaken the grain boundaries and cause adverse effects on the mechanical properties particularly in hot condition (hot shortness). Dendrite shaped inclusions – Excessive amount of strong deoxidizer (aluminum) results in formation of dendrite shaped oxide and sulphide inclusions (separate and aggregated). These inclusions have melting point higher than that of steel. Sharp edges and corners of the dendrite shaped inclusions may cause local concentration of internal stress, which considerably decrease the ductility, toughness and fatigue strength of the steel. Polyhedral inclusions – Morphology of dendrite shaped inclusions may be improved by addition (after deep deoxidation by aluminum) of small amounts of rare earth (cerium, lanthanum) or alkaline earth (Calcium, Magnesium) elements. Since their shape nearing the globular shape, polyhedral inclusions cause less effect on the steel properties than dendrite shape inclusions. In addition to the shape of the non metallic inclusions, the distribution throughout the steel grain structure is very important factor determining mechanical properties of the steel. There are the following three types of distribution patterns of non metallic inclusions normally found in steel. Homogeneous distribution of small inclusions is the most desirable type of distribution. In some steels microscopic carbides or nitrides homogeneously distributed in the steel are created by purpose in order to increase the steel strength. Location of inclusions along the grain boundaries of the steel is undesirable since this type of distribution weakens the structure of steel. Clusters of inclusions is the third type of distribution and this type is also unfavorable since it may result into local deterioration of mechanical properties such as toughness and fatigue strength etc. Distribution of non metallic inclusions may change as a result of working of steel (rolling, forging etc.). Ductile inclusions are deformed and elongated in the direction of working. The less ductile inclusions break during working and form chains of fragments. Elongated inclusions and fragmented chain of inclusions result anisotropy of mechanical and other properties. Mechanical properties in transverse direction are lower than those parallel to the direction of working. Non metallic inclusions in steel are characterized by the size, shape, concentration and distribution rather than their chemical composition. The examination of non metallic inclusion is normally carried out either by macroscopic methods or by microscopic methods. During examination only those inclusions present at the test surface can be detected. Macroscopic methods are used for those non metallic inclusions which are visible to the naked eye or are visible with the aid of a magnifying glass with a magnification of not more than 10. Only inclusions equal to or greater than 1 mm in length are taken into consideration by macroscopic examination. The standard methods used for the macroscopic examination are the blue fracture test method, the step machined test method, and the magnetic particle inspection method. In case of microscopic method of determination of non metallic inclusions, the prepared steel sample is examined at a magnification greater than 100 under a microscope to identify the nature of the non metallic inclusion. The method consists of comparing the observed field to the defined chart diagrams and taking in consideration separately each type of inclusion. Normally the chart diagrams correspond to square fields of view, each with an area of 0.50 sq mm, as obtained with a longitudinal plane of polish and as observed at 100 magnification. According to the shape and distribution of the inclusions, the standard diagrams are divided into five main groups, namely A, B, C, D and DS. These five groups represent the most commonly observed inclusion types and morphologies. Group A (sulphide type) – These inclusions are highly malleable. They are individual grey particles with a wide range of aspect ratios (length/width) and have generally rounded end. Group B (aluminate type) – These inclusions are numerous non deformable, angular, low aspect ratio (generally less than 3), black or bluish particles (at least three) aligned in the deformation direction. Group C (silicate type) – These inclusions are highly malleable, individual black or dark grey particles with a wide range of aspect ratios (generally equal to 3) and generally have sharp ends. Group D (globular oxide type) – These inclusions are non deformable, angular or circular, low aspect ratio (generally less than 3), black or bluish, randomly distributed particles. Group DS (single globular type)- These inclusions are circular, or nearly circular, single particle with a diameter equal to or greater than 13 micro meter. During the casting of liquid steel non metallic inclusions can cause nozzle clogging and disruption of casting processes. Three main mechanisms have been recognized at the origin of the non metallic inclusion which are related to the damaging effects played by these non metallic phases against the steel matrix. These mechanisms considering the non metallic inclusions are the following. Apart from some applications where non metallic inclusions are supposed to be demanded, like sulphides for improving machinability, they usually deteriorate mechanical properties and surface quality of steel products. It is widely believed that due to the presence of nom metallic inclusions some of the mechanical properties of steels like ductility, toughness, anisotropy, and formability might be negatively affected. The harmful effects of non metallic inclusions on fatigue properties of steel parts are because they can act as potential sites of stress concentration that can initiate cracks under cyclic loadings. Non metallic inclusions, which are undesirable components of all steels, play an important role with respect to their effect on the steel properties. Controlling inclusions in steel is closely connected with the concept of clean steel. The improvement in steel properties by control of non metallic inclusions plays an important part in defending the applications of steel against newer competitive materials. The aims of the metallurgist are to eliminate undesirable inclusions and control the nature and distribution of the remainder to optimize the properties of the final product. The methods of restricting the content of non metallic inclusions in steels as well as modification of the morphology of these inclusions for the improvement of the properties of steels is known as non metallic inclusions engineering.